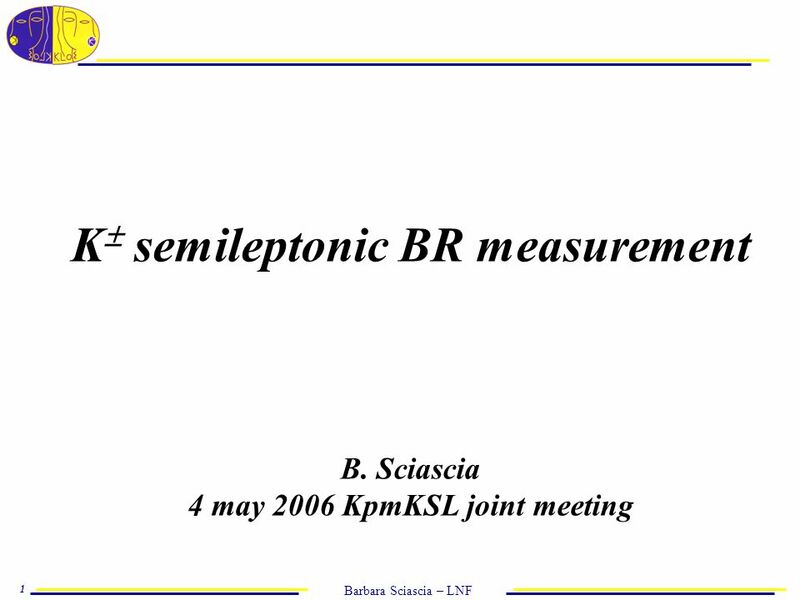 Barbara Sciascia – LNF 1 K  semileptonic BR measurement B. Sciascia 4 may 2006 KpmKSL joint meeting. 2 Barbara Sciascia – LNF 2 Analysis scheme Tag: Selection. 4 different samples are used. Signal: Selection. Counting by means of a Fit procedure. Efficiency: From MC. 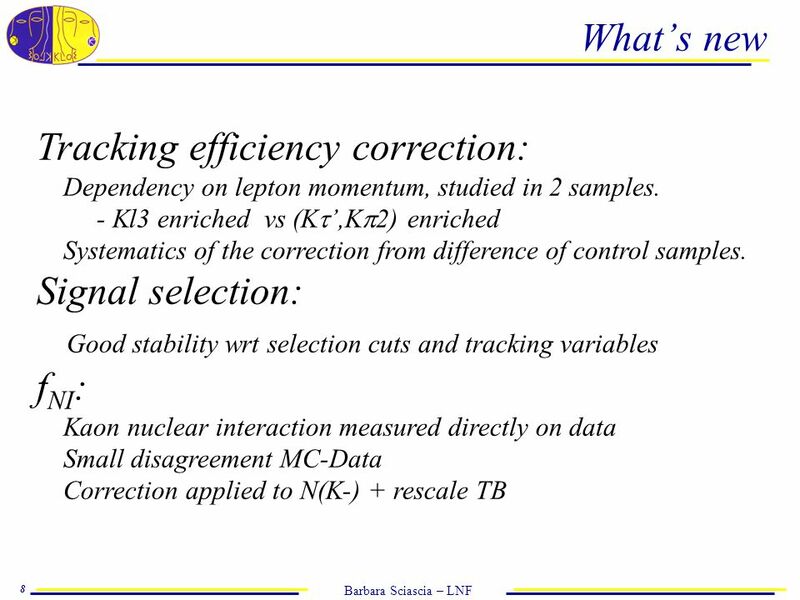 Data/MC corrections for Tracking, Track-to-Cluster, and Photon efficiencies. 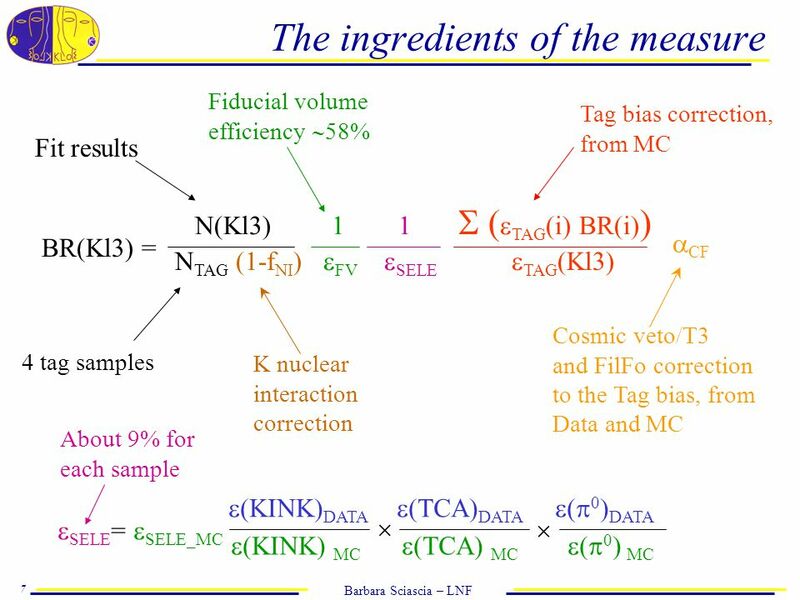 Results: BR(K   0 e  ) and BR(K   0   ) Systematics: from Tag bias, FilFo, Cosmic veto/T3, Trigger, K  nuclear interaction, Fiducial volume, Signal selection, and Efficiencies. 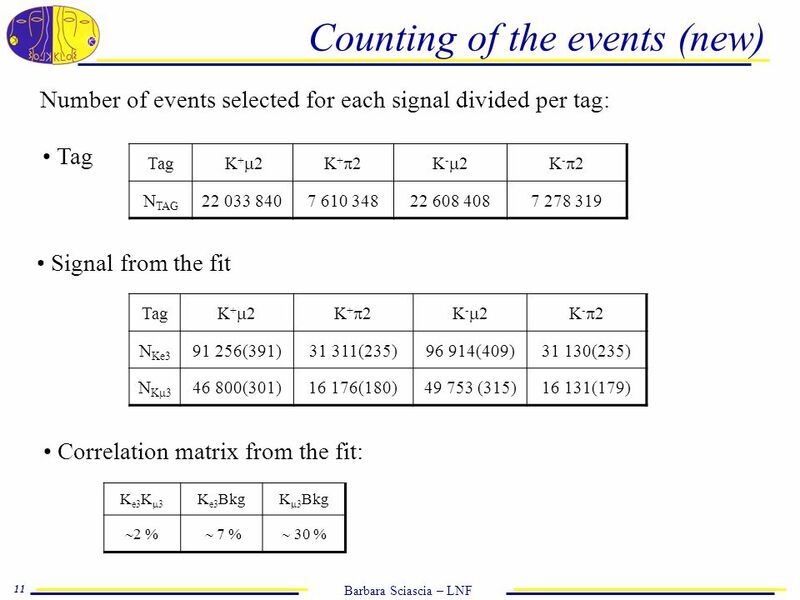 3 Barbara Sciascia – LNF 3 Signal selection 1-prong kaon decay vertex in the fiducial volume (40   VTX  150 cm) daughter track extrapol. 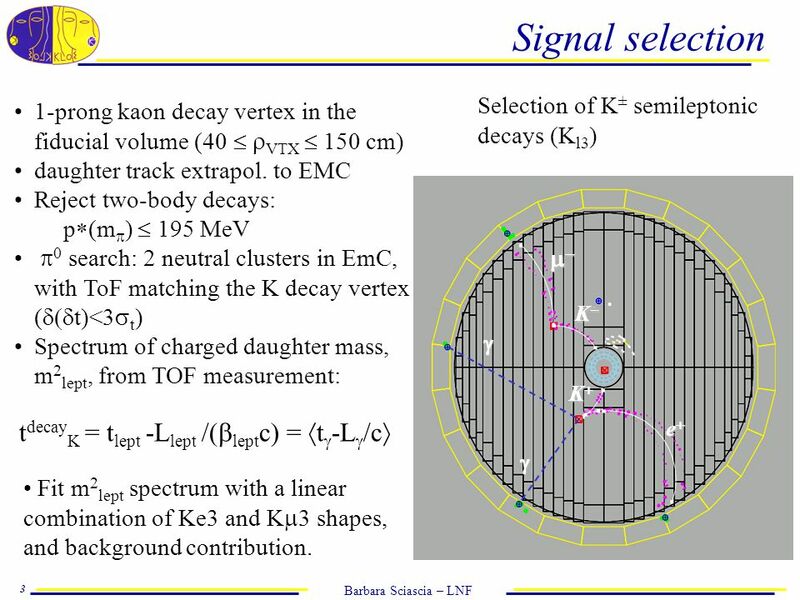 to EMC Reject two-body decays: p  (m  )  195 MeV  0 search: 2 neutral clusters in EmC, with ToF matching the K decay vertex (  t)<3  t ) Spectrum of charged daughter mass, m 2 lept, from TOF measurement: t decay K = t lept -L lept /(  lept c) =  t  -L  /c  KKKK  KKKK eeee   Selection of K ± semileptonic decays (K l3 ) Fit m 2 lept spectrum with a linear combination of Ke3 and K  3 shapes, and background contribution. 6 Barbara Sciascia – LNF 6 Signal selection: m 2 final shapes The previous cuts reject about 96% of background events The efficiency on the signal is: about 55% for both Ke3 and K  3 K  0  0 K  0 K nucl.int. 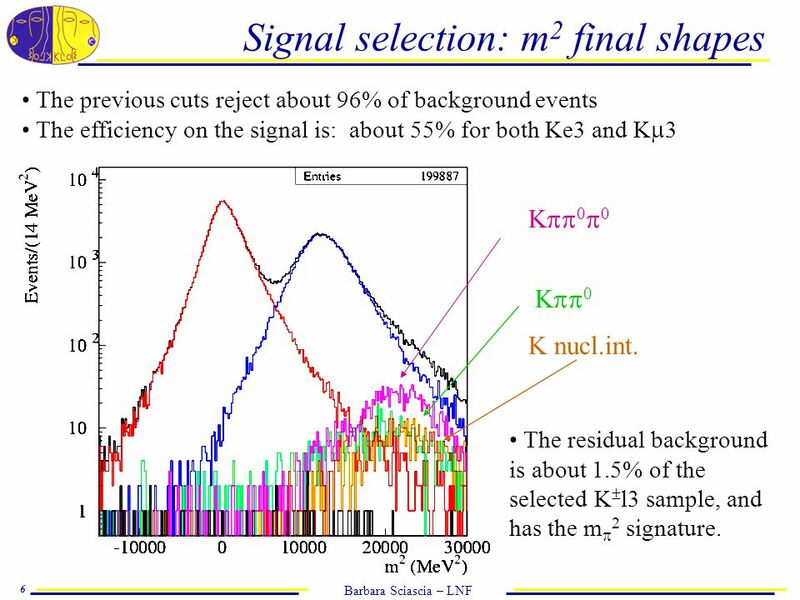 The residual background is about 1.5% of the selected K  l3 sample, and has the m  2 signature. 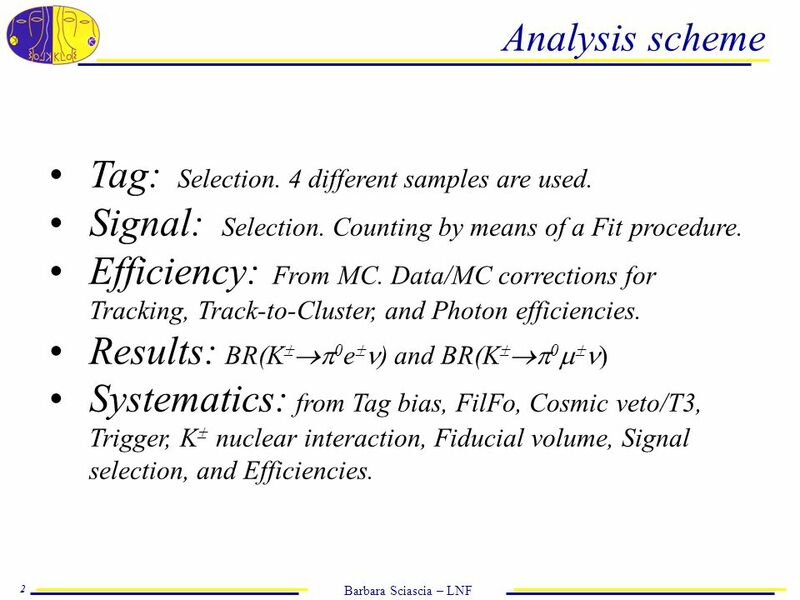 15 Barbara Sciascia – LNF 15 K  ℓ3 - Results The error accounts for the data and Monte Carlo statistics used in the fit, the MC statistics for the efficiency estimation, the Data/MC efficiency corrections, and the systematics on the tag selection. 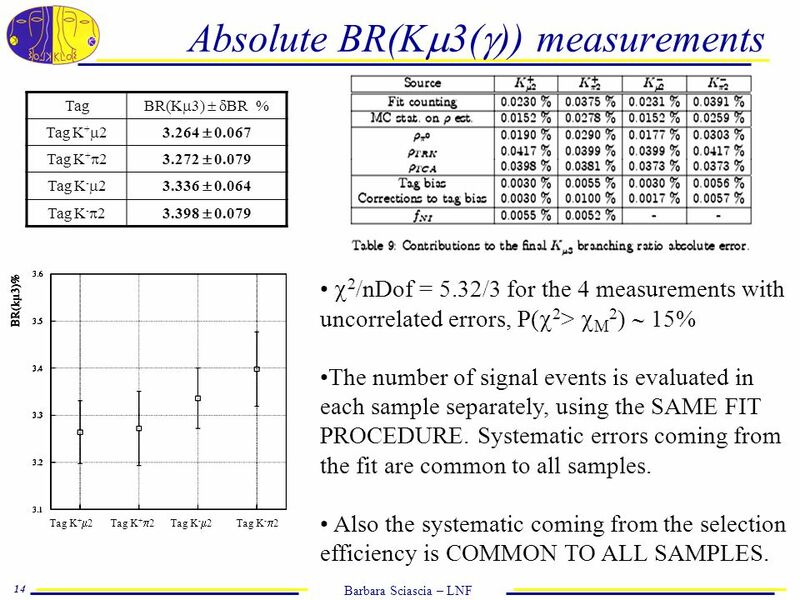 The systematics due to the signal selection efficiency is under evaluation.  2 /nDof for the 4 measurements: Ke3: 3.20/3, P(  2 >   2 )  36% K  3: 5.32/3, P(  2 >   2 )  15% Averages carefully calculated taking correlations into account: BR(Ke3) 5.047  0.046  Sys Sig% BR(K  3)3.310  0.040  Sys Sig % Tag K -  2Tag K +  2Tag K -  2Tag K +  2 Tag K -  2Tag K +  2Tag K -  2Tag K +  2 KLOE preliminary The error is dominated by the error on Data/MC efficiency correction. Fractional accuracy of 0.9% for Ke3, 1.2% for K  3. 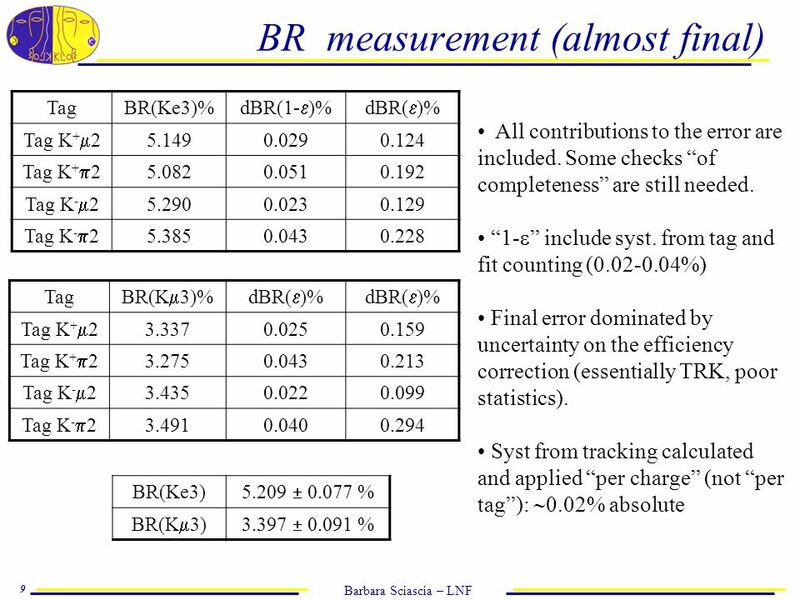 Download ppt "Barbara Sciascia – LNF 1 K  semileptonic BR measurement B. Sciascia 4 may 2006 KpmKSL joint meeting." Sabino Meola Charged kaon group meeting 12 October 2006 Status of analysis. Sabino Meola Charged kaon group meeting 14 December 2006 Status of analysis. 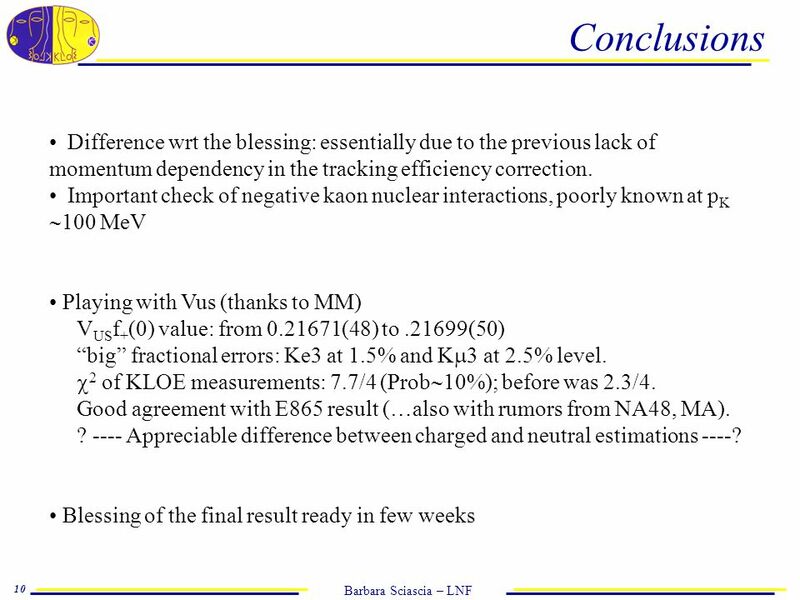 Recent Results on Radiative Kaon decays from NA48 and NA48/2. Silvia Goy López (for the NA48 and NA48/2 collaborations) Universitá degli Studi di Torino. 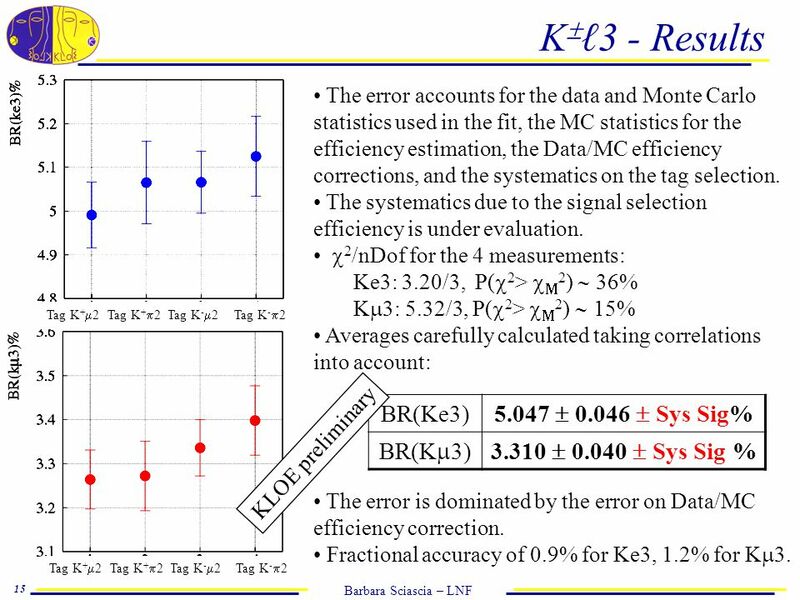 KLOE GM Capri May 2003 K charged status report DE/Dx development vs PiD (next talk by E.De Lucia) →K e3 studies: initial design of efficiency measurement. Sabino Meola Charged kaon group meeting 12 October 2005 Status of analysis. Current limits (95% C.L. ): LEP direct searches m H > GeV Global fit to precision EW data (excludes direct search results) m H < 157 GeV Latest Tevatron. Salvatore Fiore University of Rome La Sapienza & INFN Roma1 for the KLOE collaboration LNF Spring School “Bruno Touscheck”, Frascati, May 2006 CP/CPT. 14 Sept 2004 D.Dedovich Tau041 Measurement of Tau hadronic branching ratios in DELPHI experiment at LEP Dima Dedovich (Dubna) DELPHI Collaboration E.Phys.J. 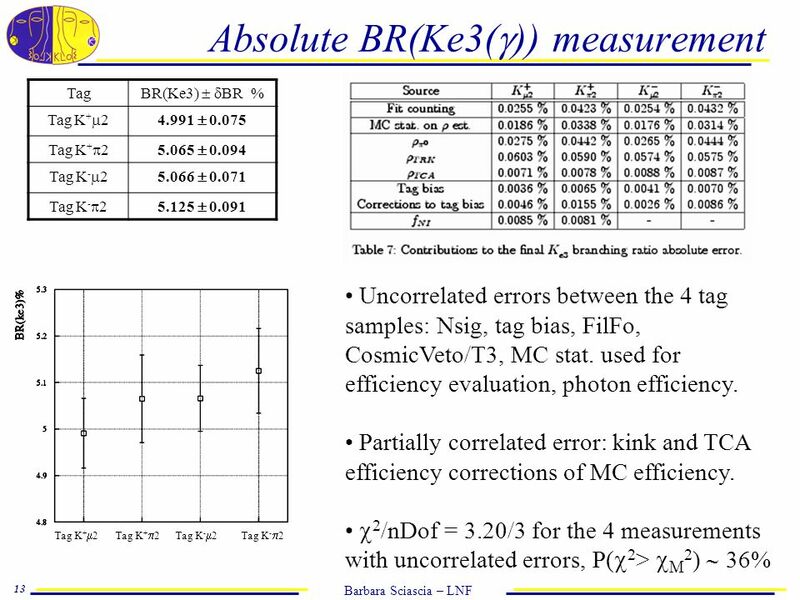 Measurement of the absolute BR(K  +  -  + ) : an update Patrizia de Simone KLOE Kaon meeting – 21 May 2009. June 6 th, 2011 N. Cartiglia 1 “Measurement of the pp inelastic cross section using pile-up events with the CMS detector” How to use pile-up. 1 Semiexclusive semileptonic B->charmdecays C. Gatto - INFN Napoli A. Mazzacane - Universita’ di Napoli April 10, 2003. A. Dabrowski, June Ratio(ke3/pipi0) 1 Final Results Γ(Ke3)/ Γ(pipi0) Anne Dabrowski Northwestern University NA48/2 Collaboration Meeting 08 June. Bo XinRare D Semileptonic Decays 14/23/2006 Studies of Rare Semileptonic D Meson Decays  Introduction  Analysis Technique  Testing the procedure  Results. July 2001 Snowmass A New Measurement of  from KTeV Introduction The KTeV Detector  Analysis of 1997 Data Update of Previous Result Conclusions. 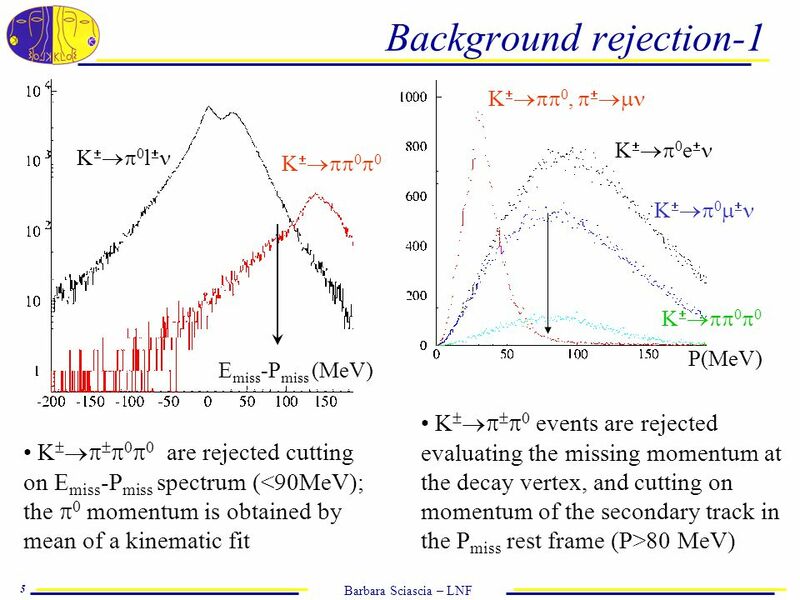 Top Turns Ten March 2 nd, Measurement of the Top Quark Mass The Low Bias Template Method using Lepton + jets events Kevin Black, Meenakshi Narain. Report of the Oscillation Working Group and status of Charm study 1 F. Juget – D. Duchesneau Ankara, April 1rst 2009. 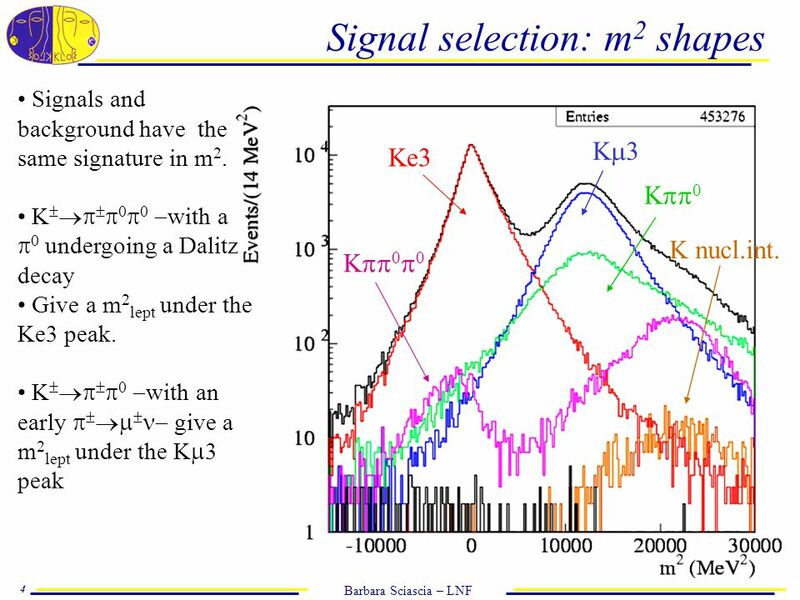 A High Statistics Study of the Decay M. Fujikawa for the Belle Collaboration Outline 1.Introduction 2.Experiment Belle detector 3.Analysis Event selection.